Finding the right chainsaw for your needs can be difficult, and I believe spending around $500 is the right amount to get a quality mid to high range tool without breaking the bank. 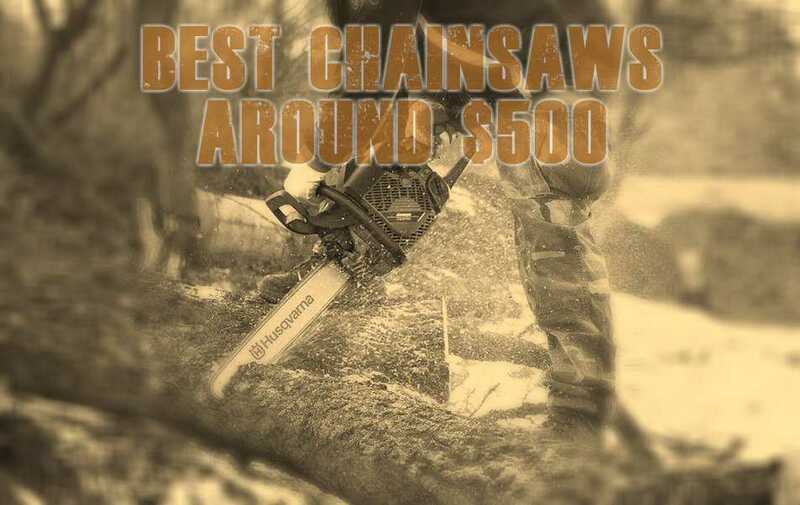 This does bring up the question, what are the best chainsaws for under $500 dollars? This is a tough question to answer. Since you’re spending a lot of your hard earned money, getting the best value for your dollar is important. And there are a lot of chainsaws on the market, so narrowing it down isn’t easy. Which is where I hope to help you with your choice of finding the best chainsaw for you. The chainsaws you get at this price range vary quite a bit compared to a lot of other price ranges. At lower price points you will get a wide variety of chainsaws, even the $400 chainsaws. But with these chainsaws that cost about $500, your going to get a quality unit that is going to be better then most other on the market. The only models that will be better is when you’re spending close to a thousand dollars. But not many people will be able to afford such a model, unless they plan on milling. so below you can find a handful of the best chainsaws which come in around the 500 dollar mark. 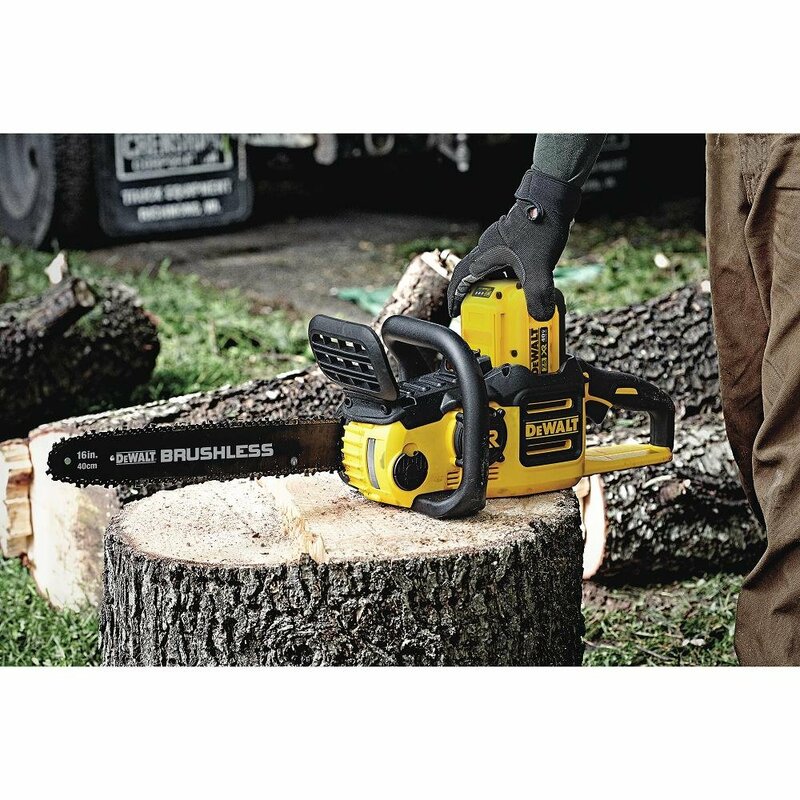 1 Best Gas Powered Chainsaw For $500? If you’re interested in a battery powered chainsaw then you will need to spend a bit more to get a decent model. This can be a tough ask for some people, since generally they won’t be as powerful as gas chainsaw. But they are so much easier to start it’s worth the extra price, especially if you have had some shoulder issues in the past. Generally when you do use a chainsaw you don’t want to be be using it for 3 to 4 hours straight, so having a 2 hour battery life is fine and not as bad as you would think. Plus you don’t have to worry about gas going stale and old. So if you don’t mind the idea of something that starts easier and don’t require a lot of power, then battery is a great choice. Best Gas Powered Chainsaw For $500? 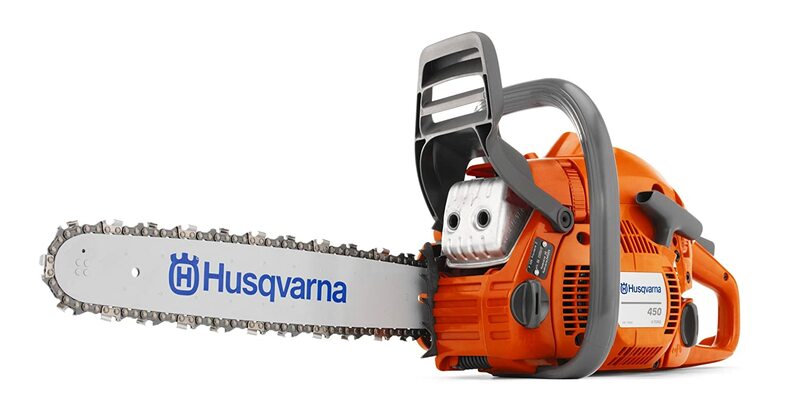 The Husqvarna 450 is a very impressive unit and one of the best chainsaws on the market. This is thanks to its powerful 50.2cc X-Torx gas powered engine, which will provide most people the power they need. This chainsaw is really designed for people who don’t do a lot of cutting, and more for the people who don’t cut as often. But when you do go to cut, you will have plenty of power there to get through all but the most stubborn of woods. And being a X-Torx engine means it has better fuel economy. But one of the biggest selling point of this chainsaw is its smart start system. This system really helps remove the biggest issue you can have with a gas chainsaw, and that is how difficult to start they can be. Now what is smart start? The really simple answer is it’s a compression release. What this means is that the engine turns over a lot easier, which means it starts easier. Which is such a great shoulder saver, and something I personally really love. This chainsaw does have a few extra quality of life improvements, with the best being the smart start which I mentioned above. One of the other features that I like is that it has a tool less chain tightening system, so you don’t have to carry any extra tools to tighten the chain which is great. The other two features I like are designed to make maintenance easier, and they are the snap lock cover, so you can get to the spark plugs easier, and its quick release air filter system. And anything that makes maintenance and cleaning the saw easier, is a big positive in my books. When you have used as many gas chainsaws as I have, having a system that makes a chainsaw start easier is a big plus in my eyes. The engine being apart of Husqvarnas X-Torx range is something I like, anything to cut back on buying more gas. This chainsaw can cut through some impressive things for its size, but if you want to cut something bigger you can put a bigger bar on it to get through larger things. The quality of life improvements to help make maintenance and cleaning the chainsaw are extremely useful. Made from one of the most reputable brands in the industry. 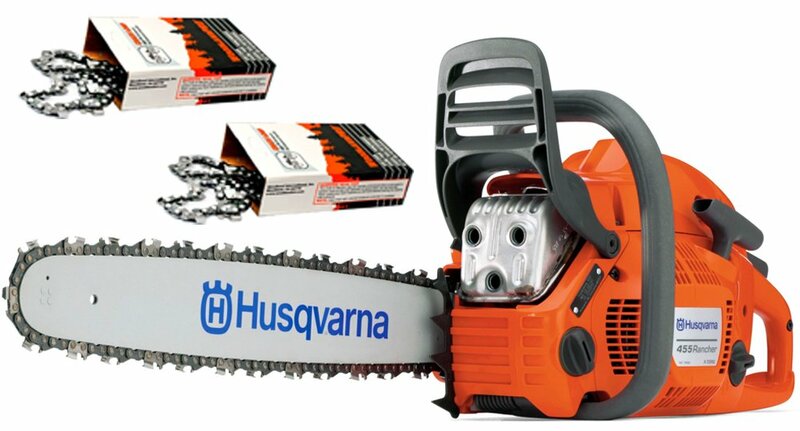 See more Husqvarna chainsaws here. If you have ever used a power tool then most likely you have heard of Dewalt, so it’s no surprise that they made this list. Dewalt is synonymous with with quality, and that is exactly what you will get with this battery powered chainsaw. The one thing I should mention is that Dewalt tools are expensive, so if you already have a Dewalt tool with the same battery. You can get this chainsaw without the battery and charger to make it a bit cheaper. The battery is is a 40V Max 7.5AH Lithium Ion Battery, so if you do have another tool with that battery then it can save you a bit of money. One of the first things I look for in a battery chainsaw, is how long will the battery last? This is an important question to me, if it’s a dud battery then it’s not very useful in my opinion. So I’m happy to report that isn’t the case with this chainsaw, which isn’t a surprise considering who manufactures it. The one thing to remember with a battery powered chainsaw is the more you push it, the quicker the battery drains. But I got close to 3 hours with pretty consistent use, cutting down small to medium sized trees. This chainsaw does have a few extra features like most do, but it has one of my personal favorites. Which is the ability to oil itself automatically, which is a time saving ability that I like. Tho there is one drawback to this particular auto oiling system, which is it does use more oil then the average chainsaw in my testings. A small issue but one I had to mention. It also has a tool less tension system which is useful, since the chain does seem narrow and needs to be tightened more often then I would like. Overall two small setbacks in otherwise great features. One of the things I really liked about this chainsaw is its variable speed trigger, which just gives you more control while cutting. The battery life on this chainsaw is incredible, and one of the better batteries on the market. Especially getting close to 3 hours use out of one charge is impressive. While this chainsaw has a 16 inch bar on it, I reckon it could easily handle an 18 inch bar, which puts it on very solid footing compared to the Husqvarna above. Being a battery powered chainsaw does have one great advantage compared to other models on this list. And that is they are so much quieter to the point that I didn’t use ear muffs. Tho I still recommend them for safety reasons. The 455 rancher is a great chainsaw that is great value for money with this particular version, and that is thanks to the extras that it comes with. Whenever you buy a chainsaw you should always get some extra chains, and sometimes an extra bar. So I was thrilled that this particular model comes with 2 extra chains. This is the perfect starter kit for someone who is looking to get into chainsaws, and don’t know where to start. You get a great chainsaw with a good size bar, and the extra chains is a great advantage in my eyes. And even if it isn’t your first chainsaw, it still one of the best chainsaws on the market. How Much Power Will $500 Buy You? In terms of power this thing is on the top of this list, with its powerful 55-1/2cc 2 stroke engine. Which when you combine this with its 20 inch bar makes this chainsaw a beast. It will easily get through what the average home owner needs, and then some. So if you require some tough jobs that need to be cut, then this is the chainsaw to go for. The rancher range was designed to handle the more tougher woods, and this does exactly that. One of the things that really stood out to me is just how well the engine ran, and how reliable it was. Even using the saw for close to 6 hours straight, there was no engine sputtering. It just ran so smooth, and one of the big reasons it made this list. Reliability in a chainsaw is important, considering how sometimes they feel they can break down for no reason. So having the extra reliable motor really let me relax a bit more when using it. Coming with the farm tough bar that was 20 inches, was a great choice and made it more useful then a lot of other chainsaws at this size. The powerful engine combined with the bar size just seemed to work perfectly, even tho it could handle a larger bar and be just as good. Coming with the extra chainsaw is something I’m a fan of, just saves time having to go find more chains. In my opinion you can’t go wrong with any of the chainsaws on this list, they are all excellent at what they do. It’s hard to make a chainsaw list and not include Husqvarna, so having two on this list was bound to happen. The Dewalt is the chainsaw that surprised me the most, and has turned me into a fan of battery powered chainsaws. Having a long lasting battery and a decent amount of power, with out any of the start issues, or noise of a gas chainsaw impressed me. Tho in terms of power the 455 rancher easily takes the number 1 spot, and that is hard to pass up. So in terms of power the rancher is king, and in terms of ease of use the Dewalt is king. Leaving the 450 in a awkward spot, being more powerful then the Dewalt and slightly cheaper. So that is something to think about. When trying to find the right chainsaw, there are a few things you should consider before buying. Such as what do you need it to do, what powers it, what brand, and how much are you willing to pay. If you’re on this page you have already worked out your budget, so you’re already ahead of everyone else! The one thing to remember when you’re spending this kind of money, is that this is a mid range chainsaw. Which will suit most people and might even be overkill for others. If you think a $500 chainsaw is too much power for your needs, a $300 chainsaw may fit the bill better. Since these are classified as mid range tool, which I thought I should mention, in case you’re not the most experienced user. Knowing what you need your chainsaw to do is one of the best ways to choosing the right tool for you. If you only need to handle some smaller tasks like cutting smaller trees down, or delimbing some trees. Then you won’t really need a 50cc gas chainsaw, and would be able to get by with a smaller electric chainsaw. So working out what you need to cut down, and what you may need to cut in the future should be your first step. If you’re looking to remove some medium sized trees and some softer large trees you will want something a bit larger, roughly around 50ccs. If you’re wondering why brand is important, it’s actually for a very simple reason that most people might not think of. No matter what you pay for something, most likely some day it is going to break down. Unless you know what you’re doing, fixing them yourself isn’t always a possibility. So going with a more well known brand, increases the chances of them being partnered with a local mechanic. This means if you do need it fixed you can get through someone who is partnered with the manufacture which could keep it covered by warranty. Or the place you take it to get repaired under warranty. Which just makes life easier.